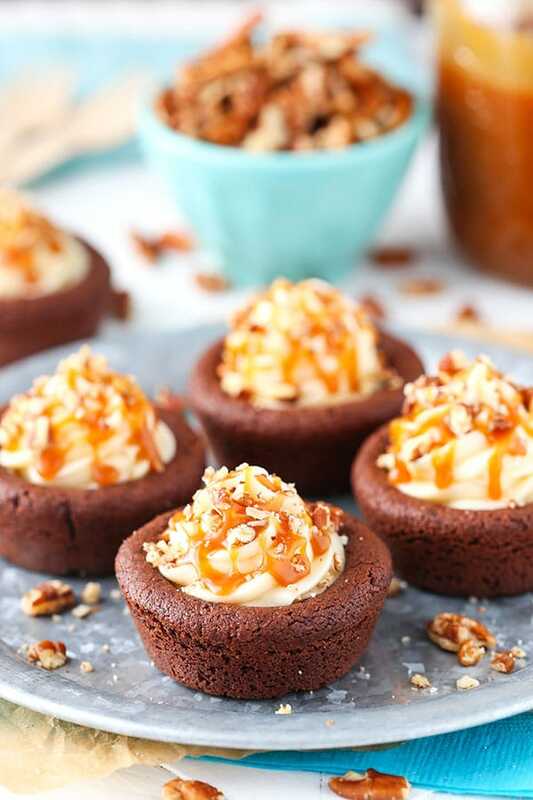 These Turtle Chocolate Cookie Cups have a moist, chewy chocolate cookie base, a caramel cheesecake filling and are topped with a caramel drizzle and chopped pecans! The perfect cookie for sharing over the holidays! So this past weekend we went to visit my parents. We went to a Panthers game, had a baby shower to attend and also had a little cookbook party for friends and family in Charlotte – which is basically where I grew up. With so many things happening in one weekend, the car was quite loaded down. 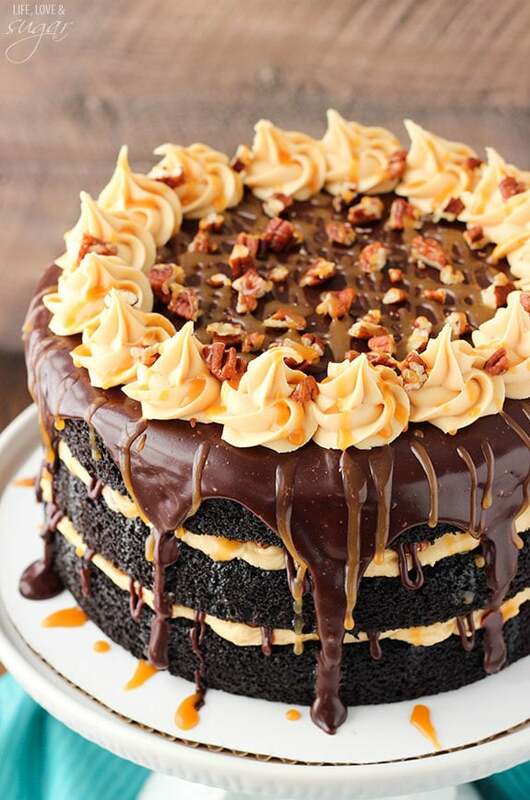 Since we were celebrating the cookbook, I made several things from the book for people to try – Margarita Cupcakes, Red Wine Chocolate Cake, Bananas Foster Cheesecake, Bourbon Peach Streusel Cheesecake, Caramel Popcorn Layer Cake and Bourbon Spice Toffee Layer Cake. Of course they were all in some kind of mini form so people could try them all. It was so fun to watch everyone sample them. The Bananas Foster Cheesecake was the biggest hit both this weekend and last. I doubled them this time around and they were still the first to go! But we all made it – and so did the desserts! It was a great weekend. 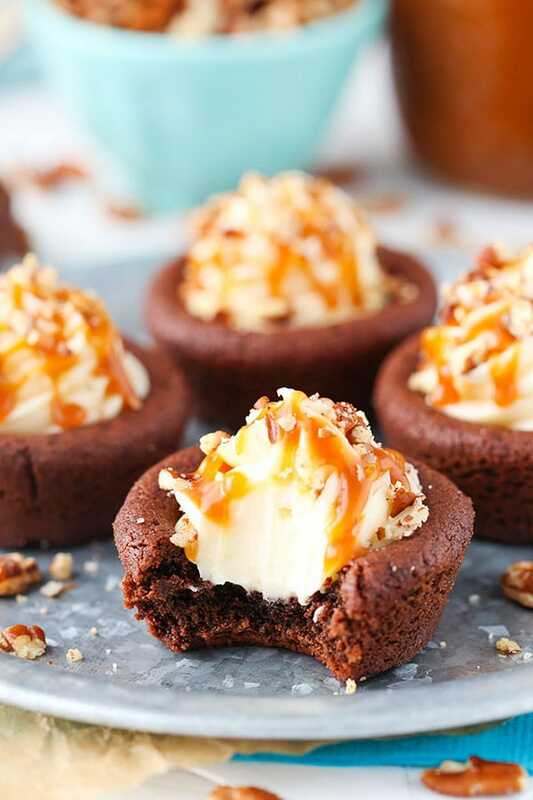 Speaking of great desserts – these are a must! I am always a fan of anything turtle flavored. 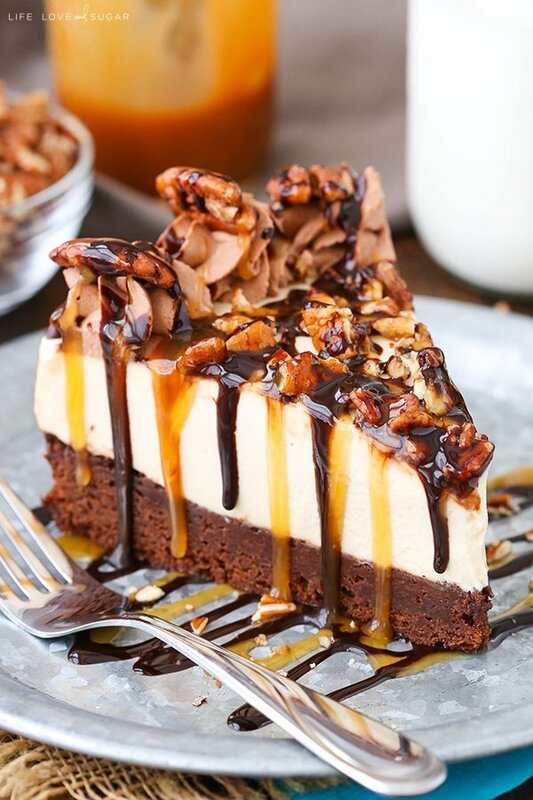 Chocolate, caramel and pecans are a match made in heaven! Plus, they really are easy to put together and add a little more fancy to your cookie tray than your average chocolate chip cookie. Yay for the holidays! They are coming fast! 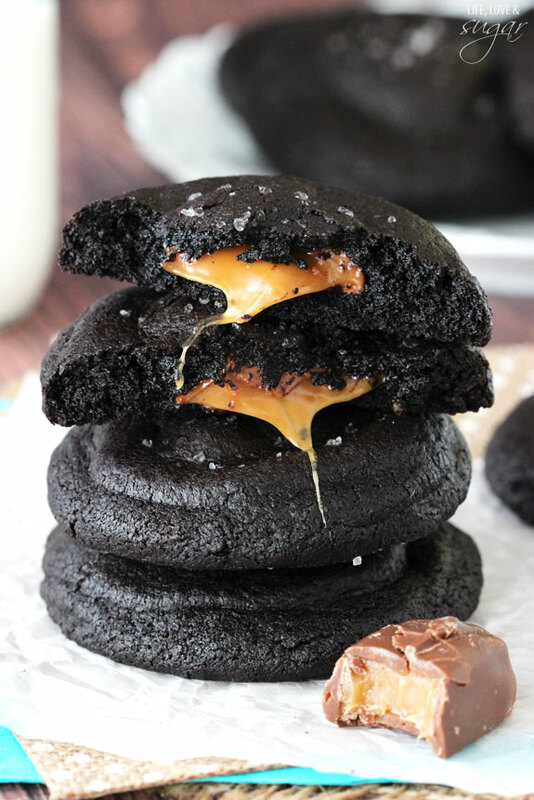 The base of these is a moist chocolate cookie. Like most of my cookies, you’ll start with creaming the butter and sugar until it lightens up and gets nice and fluffy. 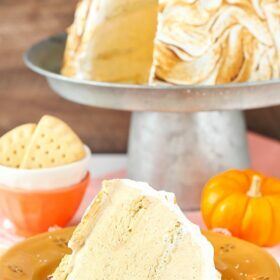 You’ll add an egg and some vanilla extract, then the dry ingredients and you’re ready to go – easy! Feel free to make the cookie dough ahead and refrigerate it for a day or two, or bake them right away. 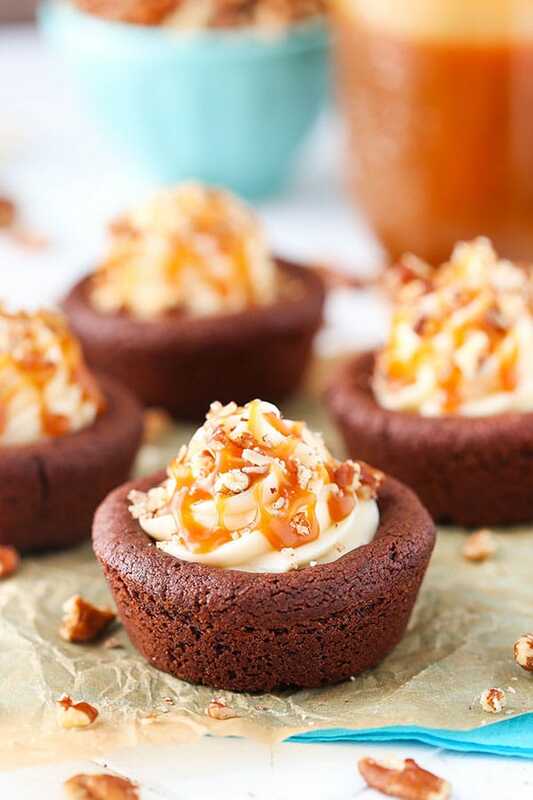 Once they are cooled, they are filled with a cheesecake filling that uses only a few ingredients – cream cheese, powdered sugar and caramel sauce. I’m a big fan of this homemade caramel sauce, but you could use a store-bought one if you wanted to save on time. 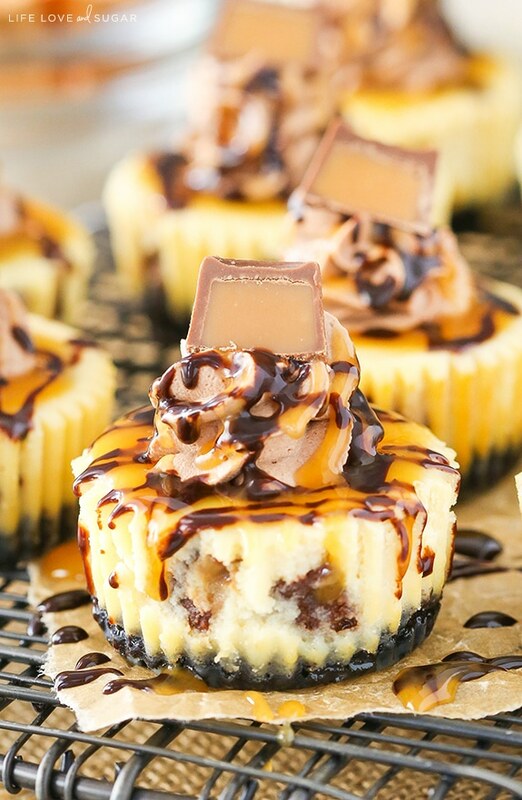 I just think the homemade one has such great flavor and gives the cheesecake an even more wonderful caramel-y flavor. 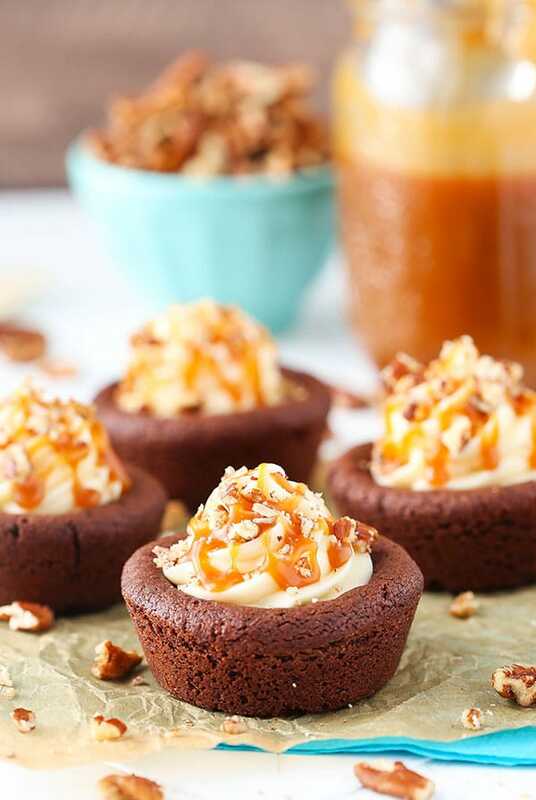 Top the cookie cups with a caramel drizzle and some chopped pecans and you’re done! 1. Spray cupcake pan with non stick cooking spray. Preheat oven to 350 degrees. 9. Add the powdered sugar and caramel sauce and mix until smooth. 10. 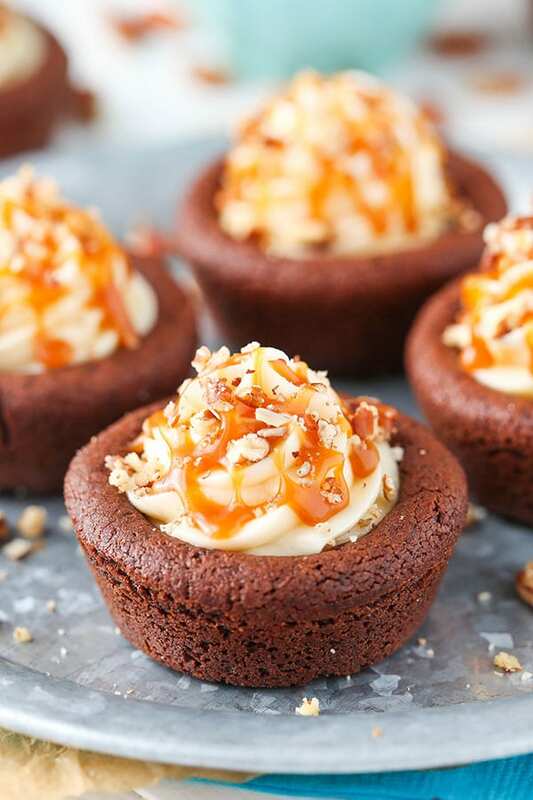 Pipe the cheesecake filling into the cookie cups and top with more caramel and chopped pecans. 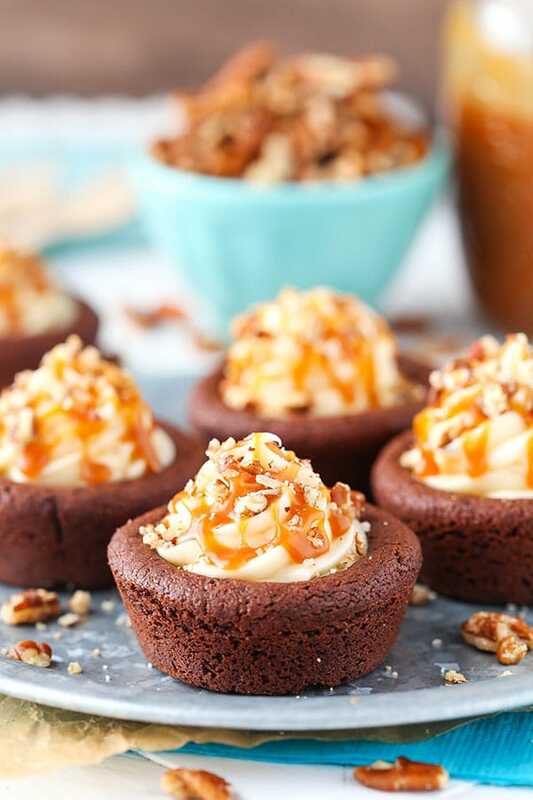 Cookie cups should be refrigerated until served. All of these turtle recipes look amazing. 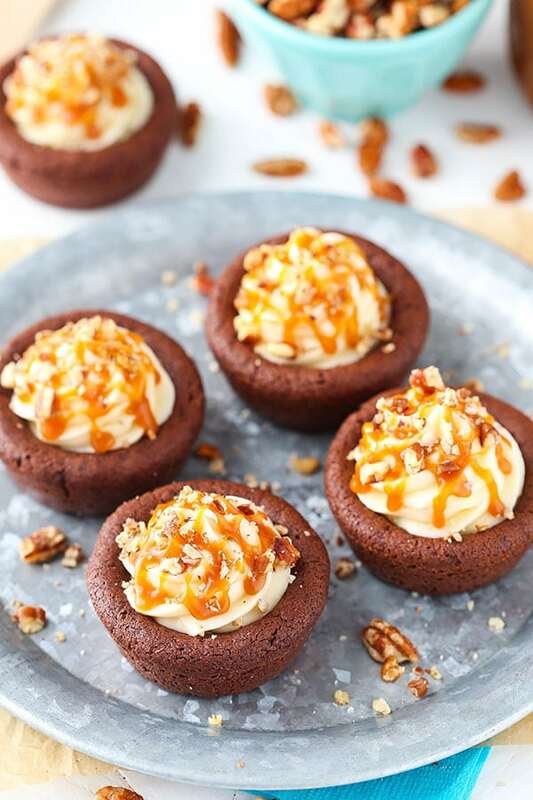 On the Turtle Chocolate Cookie Cups…it looks like you used the mini cupcake tins. Is this correct? Thanks Christa! I used regular sized cupcake tins for these, actually. 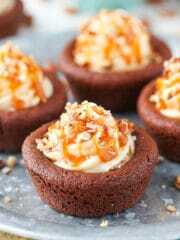 I have done some in mini cupcakes though, like this one. Everything you make is picture perfect! I’m a big fan of all things turtle chocolate! Thank you for sharing my link too! Since peach season is over with, did you make the bourbon peach streusel cheesecake with frozen or can peaches. I actually made a version with both fresh and canned peaches. 🙂 Both were great! Canned peaches did really well. I didn’t try frozen. Y-U-M!!!!!!!!!! These look like absolutely perfect little morsels. 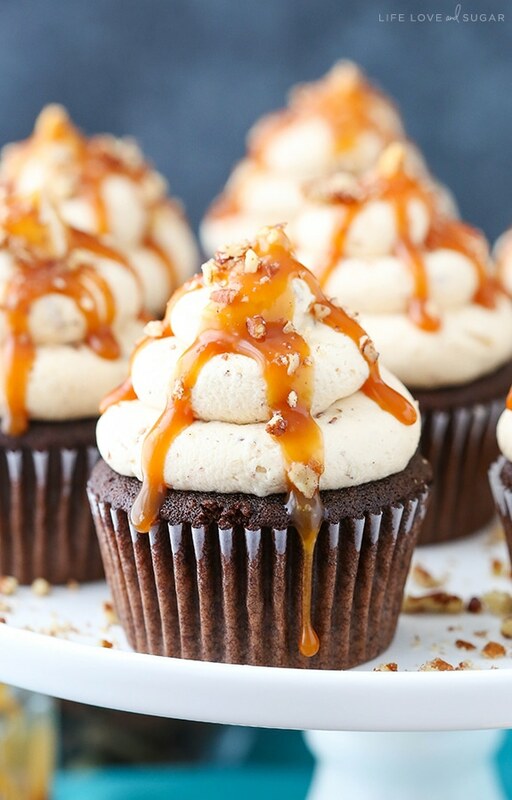 Turtles are my favorite, so whenever I see that flavor profile incorporated in a recipe, my little antennae pick up! My 13yr old daughter and I made these this weekend. Turned out beautiful and delicious! Hmm, I don’t remember it being particularly wet and sticky. Are you sure the amount of flour and cocoa added is correct? And that the butter wasn’t too soft? 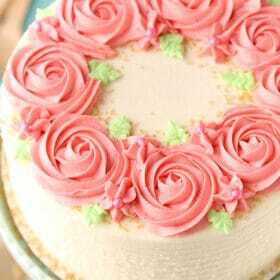 You could certainly try refrigerating it – shouldn’t hurt anything.